A mechanic in Ilesha, Osun State, Saheed Olaniyan, is cooling his feet in police custody after he was arrested for stealing a bus. The vehicle, a Toyota Hiace Bus, reportedly belongs to the St. Peter‘s Anglican Church. The same man repairs the bus for the church. It was learnt that he had led two members of his gang, Bolaji Azeez and Adebola Adekunle, to steal the bus in the dead of night. They broke the bus’ side window glass, unlocked the steering and drove it to Lagos. It was gathered that Azeez was intercepted by DCP Abba Kyari-led Inspector-General of Police Intelligence Response Team operatives at the point of selling the bus. Azeez led the police to apprehend his two accomplices. The operatives, our correspondent learnt, had acted on a report made by the church. The bus was said to have been recovered and returned to the church. In an interview with The Punch earlier in the week, 25-year-old Olaniyan said Azeez contacted him that a friend, Adekunle, wanted to buy a Hiace bus for N1.2m. He said after he looked around to get a bus for sale without success, he hatched the plan to steal the church’s. Olaniyan stated, “I live close to the church and help the church to repair the bus. Azeez called me that his friend, Adekunle, needed a Hummer (Hiace) bus and I told him I did not have any for sale. I promised to look around and get back to him. Adekunle, who also owned up to the crime, explained that he was in dire need of a job after he came out of prison in January 2018. The native of Ikire, Osun State, admitted that he contacted Azeez to help him get a bus he could use for commercial purposes. He stated that Azeez later told him there was a bus in Ilesha they could steal. 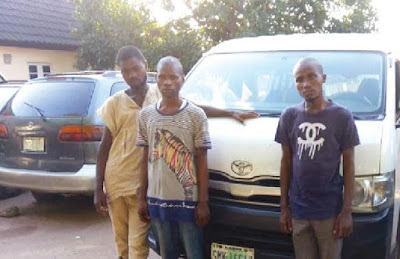 The 30-year-old driver said he agreed to pay Azeez and Olaniyan N400,000 each if the operation was successful, adding that they decided to sell the vehicle because he could not get the money to pay them. He said, “I live in Lagos. I was a tanker driver. I went to prison last year because of shortage of the petroleum product I discharged at a filling station. I spent two months in the prison before I was released in January 2018. “After I came out, I started looking for a job. I called Azeez, who used to repair the tanker I drove, to help me get a bus that I could use for transportation business. He said he would contact his friend in Osun. Three days later, he called me that he had found one in Ilesha. “We went there and met with Olaniyan who took us to the church premises at night. It was agreed that I would pay them N400,000 each. We broke the side window glass of the bus to gain entry. Olaniyan unlocked the steering and connected some wires to start the bus. We drove it out of the church compound and brought it to Lagos on February 27. We took it to a painter in Ikorodu. Azeez, 32-year-old father of two, said he was trying to help Adekunle to eke out a living. He said, “I am a panel beater. I met Olaniyan at Ladipo Market, where he came to buy auto spare parts from Ilesha. The bus is worth N2.5m. Adekunle said he would give Saheed and me N400,000 each, but he could not pay on time.